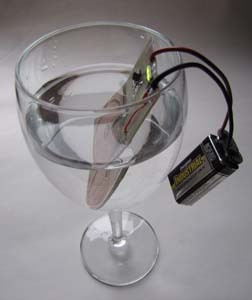 • Smallest professional emergency water purification ionizer in the World. Business card size. Provides safe drinking water and beverages for travelers. • Small, compact, light-weight, convenient for restaurant, beach and bar use to disinfect all beverages. Makes for a lively focus of conversation. Don’t travel anywhere without one. It could save your life. • Slim enough (5 mm) to fit in a wallet, purse, pocket, eye-glass case or book. • Wash salads, raw meat and foods with the treated water. • Works where UV alone will not, such as in cloudy beverages. Totally safe, whereas Chlorine, Iodine, peroxide etc may cause cancer. • Filters out chlorine by reducing it to insoluble inert harmless chloride. 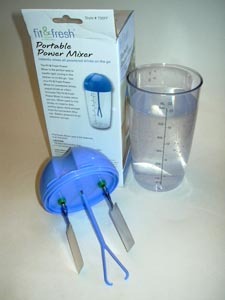 • Makes 1 litre of safe drinking water in 15 minutes. • Totally immersible. On-board violet light comes on under water. Lamp is unbreakable. • UV light on the stericard comes on automatically to help sterilize the water and to verify flow of ions and electric current from the electrodes through the water. • Large pure anode electrode (3 inch x 2 inch) for high quality and antimicrobial effectiveness. • Current into the electrodes is controlled by our constant current controlling circuit to an accuracy of 0.1 %, to the proper level of milliamperes, regardless of variations in water conductivity or of applied voltage. • Weight = 0.025 kg = 25 grams (without battery). • Comes with reinforced rigid battery snap and heavy duty wire for rough use. • High quality unbreakable printed circuit board. • Ionization disinfection technology is EPA and WHO approved for safety and efficacy. Option: A narrower version 1″ wide x 6″ long is available for the same price. This will fit into juice bottles.